I am often caught by surprise when diving into a new Image Comics series. 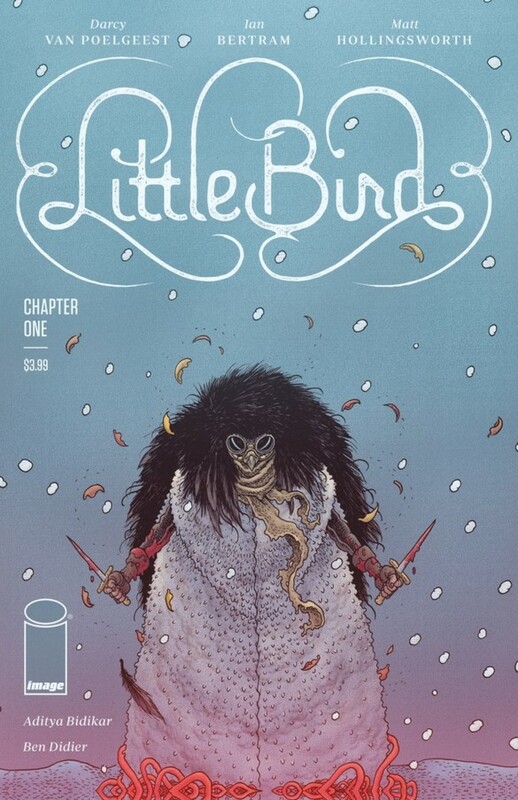 With Little Bird, I thought it would be worth checking out solely by the cover art. I didn’t read the premise, didn’t research anything on it. What I got is a tale full of high octane action, a girl struggling to survive and the discovery of a living legend. From Darcy Van Poelgeest, Ian Bertram, Matt Hollingsworth, Aditya Bidikar and Ben Didier, the story takes place in the Rocky Mountains of Canada, as a group of resistance fighters rally to take on the Holy Empire. Little Bird is the daughter of the leader of the group and is stashed away before the factions clashed with a map to find the Axe, which seems to be a glimmer of hope. When she descends out of hiding three days later, she finds her people massacred, and her mother missing. Little Bird goes to find The Axe, which is not a thing, but a person. A hero that has been locked away, a hero that stands a chance against the empire. We get to see a look into the Holy Empire and the occult like practices they instill, as well as the resilience of Little Bird, and the pure ferocity of The Axe. This mountain of a man is detailed with scars riddled across his body and is filled with pure rage. The amounts of blood and violence imposed must be seen to believe. As Little Bird’s mother is being held captive by the leader of the Empire, the Bishop. Will Little Bird and The Axe save her mom in time? Will they be able to save the North? I was blown away with this first issue. I couldn’t find a physical copy as the shops have sold out, so I checked it out digitally, and glad I did. Little Bird is a story of freedom and fighting for what’s right, no matter what it might cost you. Poelgeest gives us a very cool, original story, and the insanely detailed artwork by Bertram is some of the best and most intricate I have seen in a series. Go check out Little Bird before it flies off the shelves everywhere.